In 1996, Karma Lloyd and Bill Simmons, neither of whom had sailed before, set out in a sailboat and spent three years sailing around Mexico, Hawaii and North America. “It was liberating,” says Lloyd, 43. “Because it was foreign to us, it reminded us that even at an older age, you can do anything you want. We talked about what to do when we came back. We wanted to have art as something we could do together, but we wanted it to be functional art. That’s how we came up with making furniture.” Simmons, 54, is a metal sculptor and Lloyd has long had an interest in design. When they returned to Valleyford, Wash., in 1999, they built a 40-foot by 50-foot studio with a loft apartment above it to give Simmons space for his metal sculptures and the two of them the space they needed to collaboratively design and build furniture. For Simmons, building furniture and making metal sculptures has taught him to work with more than one material. “There are a lot of connections between furniture and sculpture, such as the importance of the finish details and the need to be accurate,” he says. “But, wood is different than metal. Wood never quits moving. It lives and breathes. Metal is what you have, and wood changes with humidity and temperature. 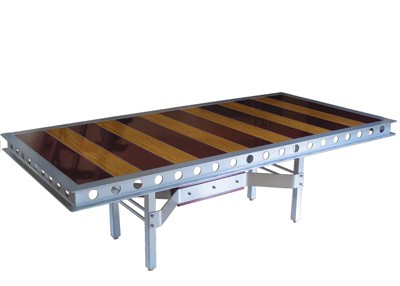 Even when you’re done working with it, it keeps moving.” Their 30-inch-high, 4-foot by 8-foot channel table (below) is made from aluminum I-beam and inlaid with purpleheart and movingui. For Simmons, who calls their furniture style Organic Industrial because of the combination of wood and metal, creating a finished look is their goal. “Frequently when people combine wood and metal, it has hunks of steel with big bolts,” he says. “Our choice from the start was to make finished furniture with fine detail.” The channel table costs $7,100. Contact Karma Lloyd and Bill Simmons at 509-443-2218 or via their website at lloydsimmonsdesign.com .